Recovery following defoliation can be modified by co-occurring site resource limitations. 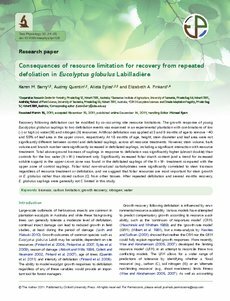 The growth response of young Eucalyptus globulus saplings to two defoliation events was examined in an experimental plantation with combinations of low (−) or high (+) water (W) and nitrogen (N) resources. Artificial defoliation was applied at 3 and 9 months of age to remove ~40 and 55% of leaf area in the upper crown, respectively. At 18 months of age, height, stem diameter and leaf area were not significantly different between control and defoliated saplings, across all resource treatments. However, stem volume, bark volume and branch number were significantly increased in defoliated saplings, including a significant interaction with resource treatment. Total above-ground biomass of saplings in response to defoliation was significantly higher (almost double) than controls for the low water (N + W−) treatment only. Significantly increased foliar starch content (and a trend for increased soluble sugars) in the upper crown zone was found in the defoliated saplings of the N + W− treatment compared with the upper zone of control saplings. Foliar total non-structural carbohydrates were significantly correlated to stem biomass regardless of resource treatment or defoliation, and we suggest that foliar resources are most important for stem growth in E. globulus rather than stored carbon (C) from other tissues. After repeated defoliation and several months recovery, E. globulus saplings were generally not C limited in this study.